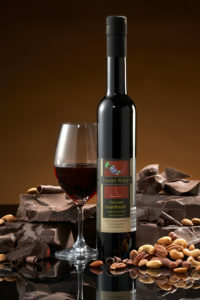 Chocolate Granfinalé™ is a dessert wine made from grape wine and natural chocolate flavor. Its generous chocolate notes and rich, warming finish make Chocolate Granfinalé a decadent evening treat. Pair it with a nut torte or raspberry, strawberry, or other fruit desserts. Sip as or after dessert. Serve at room temperature. Tassel Ridge Chocolate Granfinalé is available at the Winery and at some of our 400 plus retailers in Iowa. If you don’t see Chocolate Granfinalé at your favorite store, ask the manager to get it for you.